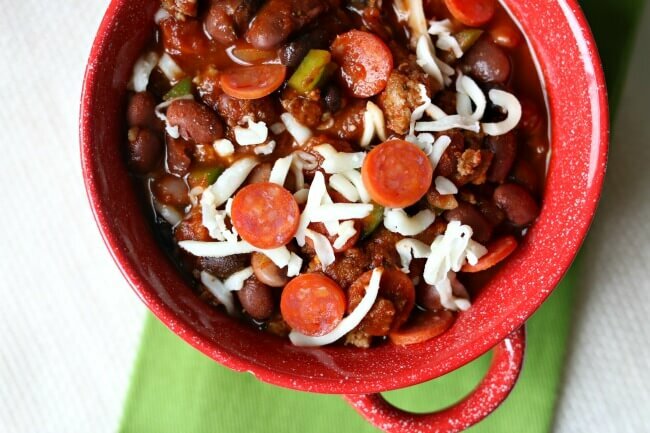 Slow Cooker Pepperoni Pizza Chili is the perfect chili for a chilly (get it?) evening or for tailgating. It is packed with mini pepperonis, Italian sausage and green peppers to give you all your favorite pizza flavors. Plus it’s of course topped with melty mozzarella cheese. This recipe is made possible by Hurst Beans. 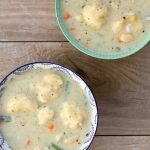 Visit their website and their Facebook page for more fall recipe inspiration! Thanks for supporting my blog and it’s sponsors. The last couple of days I just can’t seem to warm up. The weather has definitely shifted from an Indian summer to fall. It’s actually a good thing though because I can start making soups and chilis in my slow cooker again. There is nothing more comforting to me than a bowl of warm chili on a cold night. For this recipe I decided to do a recipe mash-up combining the flavors and components of regular chili with pizza. It was a match made in heaven. My whole family devoured this chili. I must admit it was a little spicy for the kids but I added sour cream to their bowls and they were fine. If you want it less spicy just make sure to use mild picante sauce, mild Italian sausage (instead of hot) and start with only half of the seasoning packet and go from there. 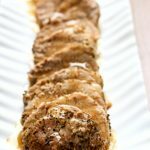 I love using Hurst’s products in my slow cooker! They have their famous 15-Bean Soup but they’ve also come out some other fun new products as well like the garlic and herb lentils. 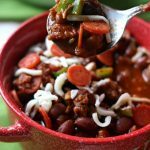 One of my favorite products is their Slow Cooker Chili. 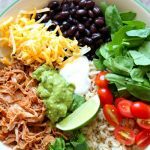 This delicious mix of pinto, black, red and kidney beans is paired with a classic chili seasoning and designed especially for your slow cooker or crock pot. So of course that is what I chose to go with for this slow cooker pepperoni pizza chili! Duh! 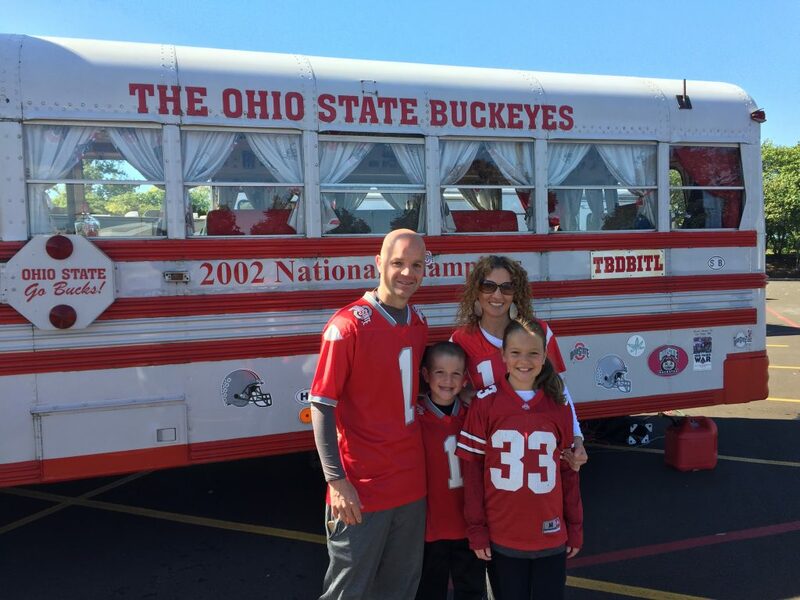 Last weekend my family and I traveled to Ohio to go to an Ohio State football game. It was nuts! I’ve never seen tailgating done like that before. But one thing I noticed over and over again was the amount of slow cookers! It was so fun. There were chilis and soups and dips and all sorts of fun foods. 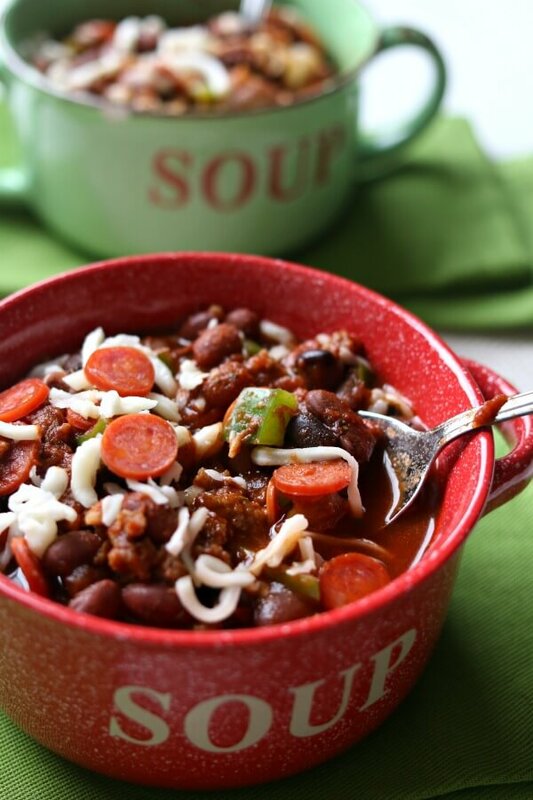 I think that slow cooker pepperoni pizza chili would be the perfect tailgating food! 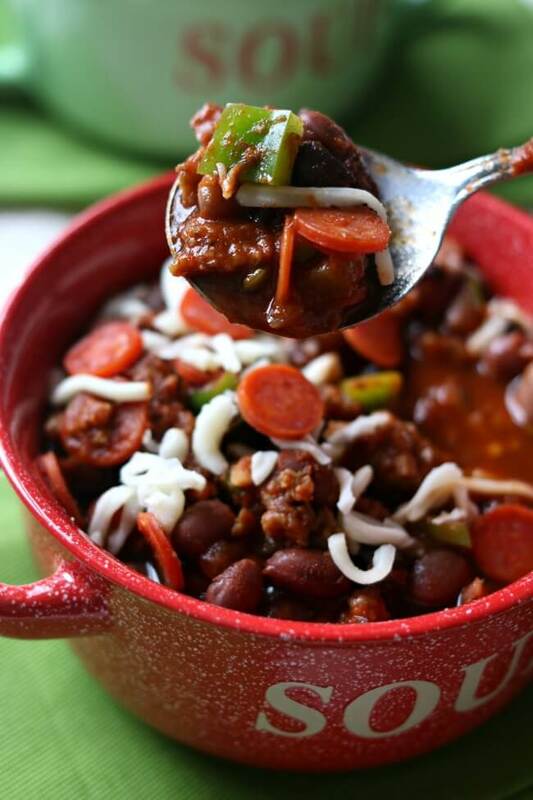 Slow Cooker Pepperoni Pizza Chili is the perfect chili for a chilly evening or for tailgating. It is packed with mini pepperonis, Italian sausage and green peppers to give you all your favorite pizza flavors. Plus it’s of course topped with melty mozzarella cheese. In a large bowl place the dried beans. Reserve the seasoning packet for later. Cover the beans completely with enough water to cover them by 2 inches. They drink up a lot of water. Sprinkle in 1 Tbsp of salt. Let the beans soak in the salty water for 8-12 hours. Drain the beans of excess water and rinse them off. 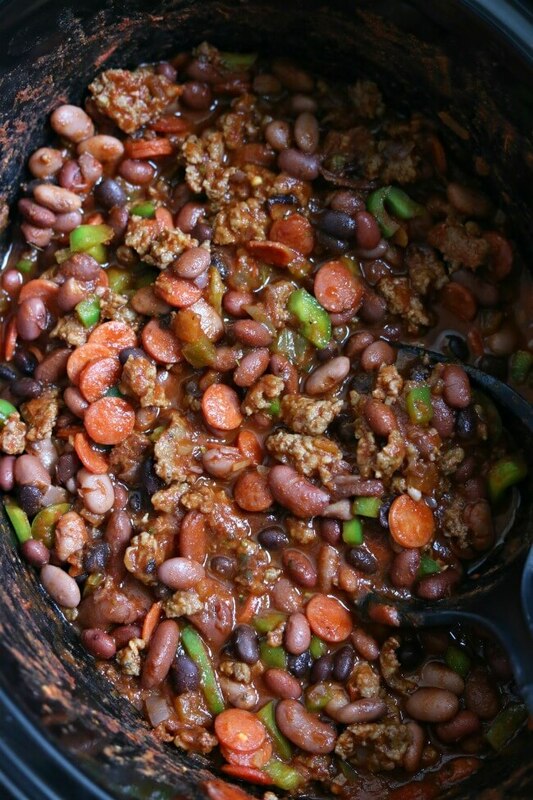 Place the beans in the bottom of a large slow cooker. (I used a 6 quart oval slow cooker). Place 6 cups of water into the slow cooker and diced onion. Cover and cook on LOW for 8 hours or on HIGH for 4 hours, or until beans are to desired tenderness. Drain off any excess water from the beans. Add in browned Italian sausage, diced green pepper, picante sauce, pizza sauce, pepperoni, seasoning packet*, and water. 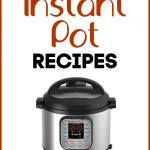 Cover the slow cooker and cook on HIGH for 1-2 hours. Ladle the chili into bowls and top with grated mozzarella cheese (about 1/4 cup per bowl). *If you don’t love spicy foods then add half the seasoning packet first and taste. Add more seasoning as desired. 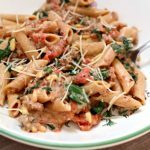 You may also want to use mild picante sauce and mild Italian sausage. 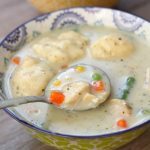 I made the recipe as it is written and just used a bit of sour cream to cool it down for my children. 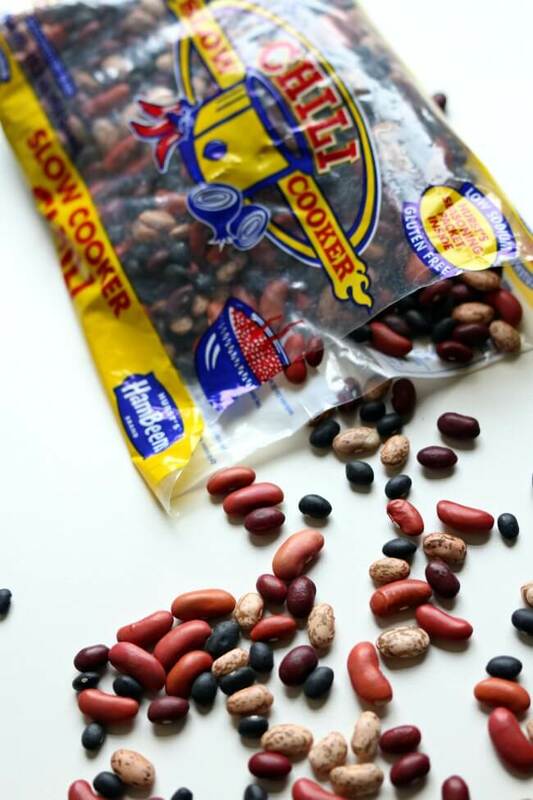 Where can you buy the Hurst slow cooker beans in store? I buy mine at walmart but I’ve also seen them at Kroger.